Twelve participants (see “To” list for names), including a visiting couple from Slovenia, enjoyed a pleasant sunny Wednesday morning of casual birding through south Ladner to Alaksen National Wildlife Area (NWA) and Reifel Bird Sanctuary. Hi-lites were: four White-fronted Geese with a large flock (~1500 birds) of Lesser Snow Geese, flock (~100) of Black-bellied Plovers in breeding plumage, many waterfowl species in breeding plumage, Marsh Wrens nesting, and the Sandhill Cranes sitting on eggs. See photos of this outing (hopefully soon) on our Picasa site at http://picasaweb.google.com/dncbirding. We started with our usual route to the Kingfisher Bridge in the Tsawwassen First Nations Reserve. As usual, the tide was low and the resident Belted Kingfisher was not seen. While enduring the customary wait for our wandering minstrel Roger to arrive, we watched the House Sparrows nesting in the street light pole and saw a few Green-winged Teal (GWT), House Finches, Barn Swallows and Northern Harriers. 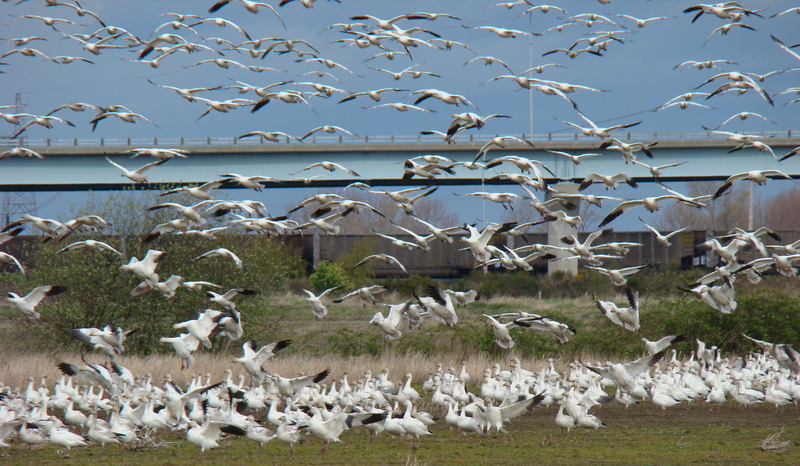 At the other end of the TFN Reserve we stopped to watch a flock of about 1500 Snow Geese feeding in a field. They entertained us with a brief circular flight, while four Greater White-fronted Geese remained feeding. Nothing unusual seen as we drove by the massive TFN construction and then past the farmers’ fields to our next stop at the Fraser River near the Westham Island bridge. Several Red-breasted Mergansers were a nice sighting here, along with one of the resident Eurasian Collared-Doves and some Gadwall, GWT, Double-crested Cormorants, two Harbour Seals, Mute Swans and the two big white resident domestic Geese at the bridge. The Bald Eagle pair were hanging around the nest; I assume their eggs have hatched and young are in the nest. According to David Hancock this is one of 58 active Eagle Nests in our area, making Delta the new Bald Eagle Capital of the World. Small swarms of Shorebirds were seen in the distance, but we were pleasantly surprised when Ken spotted a flock of beautiful Black-bellied Plovers in a field just as we passed the Gun Club. At Alaksen, we were blanked again on the Barred Owls (lots of pellets seen), but did see a Rufous Hummingbird and a White-crowned Sparrow. The ladies enjoyed the “pit stop” and our Slovenian guests grabbed a bunch of pamphlets and other info from the Feds office. No one offered me any treats, so I had a Dad’s cookie that I was saving for such emergencies. At Reifel, in the office pond were Northern Shovelers, American Wigeon and Mallards. Lots of Tree Swallows hanging around the nesting boxes. One Black-crowned Night Heron was in their customary tree, with a Hooded Merganser in the second pond below it. Lots of Sparrows on the paths, including: Golden-crowned, Fox, Song and Savannah. The Brown-headed Cowbirds have returned too. Many pairs of Wood Ducks were beautiful eye candy for us all. A lone Killdeer was resting in the north field near a flock of Canada Geese. The rookies enjoyed feeding the Black-capped Chickadees from their hands. Closer to the tower, one of the many Marsh Wrens entertained us as it sang and flitted around its nest (one of several?). It was wind-biting cold on the tower, so we descended quickly to walk the protected inland trails. Several Bufflehead, Lesser Scaup, Northern Pintail, American Coots were still in the ponds before leaving for their northern inland nesting areas. Our destination sighting, the resident pair of Sandhill Cranes took turns sitting on the two eggs, while last year’s juvenile was never far away from them. Several of us enjoyed Lorna’s spotting the all-too-common Stump Bird. We left Reifel around noon, and stopped at my friend’s barn to see the Barn Owl. He (or she) was there, but when he saw the Slovenians, he quickly escaped through the hole above the nesting box, so we did not have great looks this time. Not a lot of extraordinary sightings today, but a very enjoyable morning nonetheless. John, Kay and I had an awesome hour visit to Iona on rainy Monday where we saw very clearly about a hundred Yellow-rumped Warblers (Audubon and Myrtle), four Swallow species (Tree, Violet-green, Barn and Cliff), two Osprey, several Yellow-headed Blackbirds, pair of Cinnamon Teal, pairs of Ring-necked Ducks. The next DNCB outing will be next Wednesday, May 4, meeting at Petra’s around 7:30 a.m. for departure at 8:00 a.m. Comments are welcome, but if you don’t want to receive this diarrhea, let me know. It’s 2:30 a.m.; I’m very tired, but I am training to watch the Wedding early Friday morning, following the Canucks victory tomorrow evening over Carrie Underwood’s Nashville Predators. This entry was posted in *DNCB, Alaksen NWA, Bald Eagle, Barn Owl, Black-bellied Plover, Black-crowned Night-Heron, Cliff Swallow, Greater White-fronted Geese, Harbour Seal, Mute Swan, Northern Harrier, Reifel, Sandhill Crane, TFN, Yellow-rumped Warbler. Bookmark the permalink.